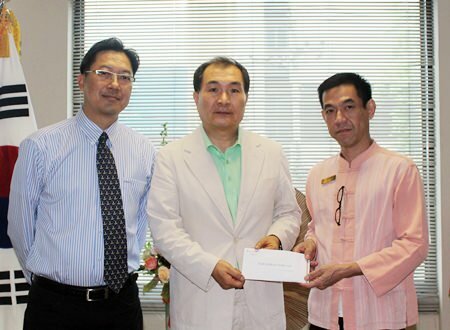 Mr. Jerome Sim (right), General Manager of Khum Phaya Resort and Spa, Centara Boutique Collection, presented donations the hotel has collected for the Korean Ferry Disaster Victims to the President of the Korean Association He is seen here with Dr. Chansiri Suetrong (left) and Mr. Kim Chul Sik (middle) the President of Korean Association in Chiang Mai. Zonta International performed a Rot Nam Dam Hua for President of the Chiang Mai Culture Council and friend of the organization Chao. Dr. Duangduan na Chiang Mai recently. 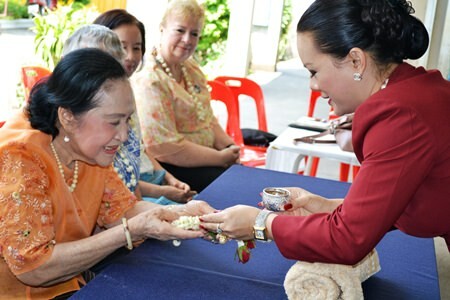 Here President Raya Luelai is seen pouring water over the hands of the woman affectionately known as Chao Yai. Phillips Electronics Co., Ltd. (Thailand) in the cooperation of Robinson Department Store Chiang Mai held the Phillips Beauty Roadshow on May 3, 2014 led by “Chompoo” Araya A. Hargate on the Ground Floor of Robinson Department Store Chiang Mai. Chompoo demonstrated hairstyling techniques with Phillips brand hair tools. From (L-R) Setthawut Thadsura, General Manager of Robinson Department Store Chiang Mai, Voravat Tantranont, Broad Director of CR Chiang Mai (Thailand) Co., Ltd., “Chompoo” Araya Hargate, Philips Brand Ambassador, Onuma Udombuddhachat, Trade Shopper Marketing Manager of Philips Electronics Co., Ltd. (Thailand), and Weerachot Thirawayamakun, Marketing Manager of Central Plaza Chiang Mai Airport. 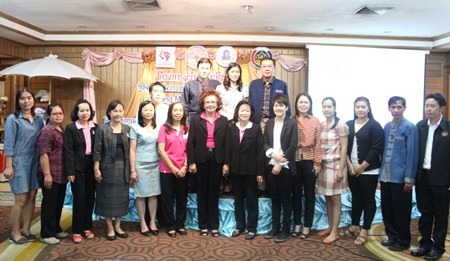 The Thai Women Empowerment Funds, Chiang Mai held the Chiang Mai Smart Lady Training seminar on April 30, 2014 at the Chiang Mai Phucome Hotel where they were joined by Boonlert Buranupakorn President of Chiang Mai Provincial Administration Organization, Tassanee Buranupakorn, Chiang Mai’s Member of Parliament Chiang Mai Mayor Tussanai Buranupakorn who joined the lecture by Wilai Buranupakorn, Chairman of Thai Women Funds, Chiang Mai who noted the goals of the project are to encourage the development of the potential and empowerment of women of the new generation as the inventive force of the country, and to encourage women to take leadership roles. 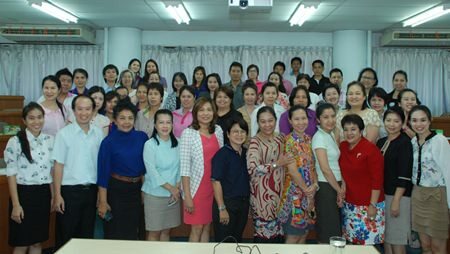 The Office of Human Resources of Payap University held an Intensive English course for the Worker Training Project for personnel of Payap University. Lecturer Yupawan Rakkatanyoo led the training session at Payap University recently. Pol. Maj. Gen. Attakit Tharichat (middle), Director of the Government Lottery Office (GLO) and Pol. Maj. Gen. Surasit Sangkhaphong (front left) gave one million baht to Dr. Sarawut Srisakun (4th right), Director of the Chiang Mai Night Safari to support the Sustainable Knowledge Building project. Here with Chiang Mai Night Safari staff and GLO staff at the Government Lottery Office in Bangkok on May 2, 2014. 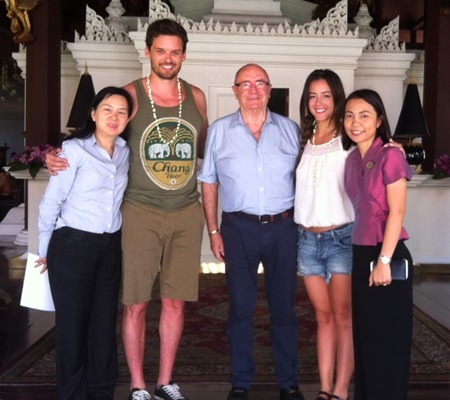 The General Manager of the Dhara Dhevi Chiang Mai Andrew Quinlan and Assistant Director of Sales Suthathip Yapanan recently welcomed Hollywood stars Mr. Austin Nicholas, who was in the films “The Day After Tomorrow and Wimbledon”, and Ms. Chole Wang, currently starring in the Marvel’s Agents of S.H.I.E.L.D on the U.S. channel ABC. The Yoga Tree held a program of weekend workshops and gatherings on May 10 & 11 that saw yoga enthusiasts as well as dance sessions, films, qigong workshops, meditation and more. 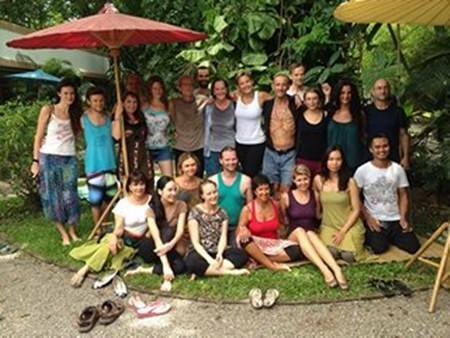 The weekend long event was held at the Yoga Tree on Arak Road and was attended by a large cross section of the Chiang Mai Community.